Here you will find a set of interesting projects we did in cooperation with customers or as an assignment from our clients. It's just a small part of our cooperation portfolio. You also find results from additions we made to our existing applications because the clients needed such a new feature. A bit of everything we suppose. All the results from this page are copyrighted by APP Helmond. You are allowed to use the examples for your own use. You cannot use these examples in any public domain, nor use these for professional commercial purposes. If you would still like to use these, please contact us. Together we'll find a way to make you happy. 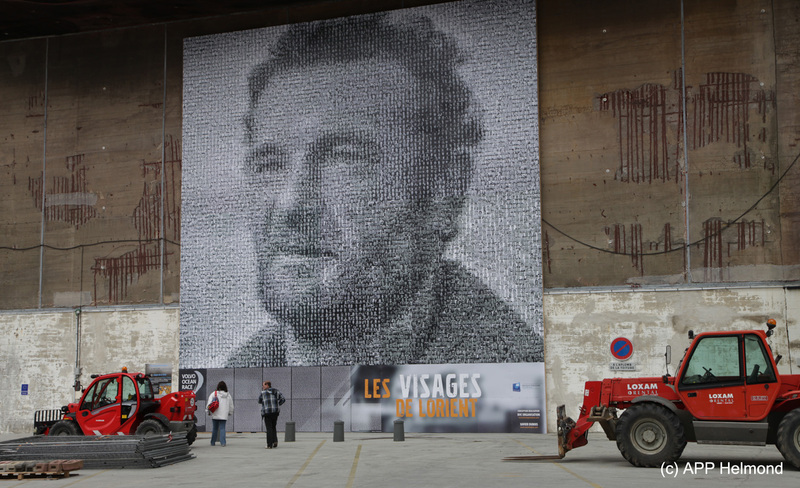 When the Volvo Ocean Race hit the French town of Lorient, we were asked to support in creating a huge 11 x 12 meter photo mosaic portrait of a French (and local) hero Eric Tabarly. The assignment was given to a French Photographer, Xavier Dubois, who photographed over 2500 people in Lorient against a black, white and gray background. Together we set to work to create the lay-out of this huge mosaic, where both the source picture and people pictures were in grayscale. Since Mosaizer XV didn't have a dedicated engine for this grayscale question we had to develop it. With help and feedback from Xavier we finally tweaked the mosaic such that all the photos were used and that it was almost impossible to find a second or third same picture. 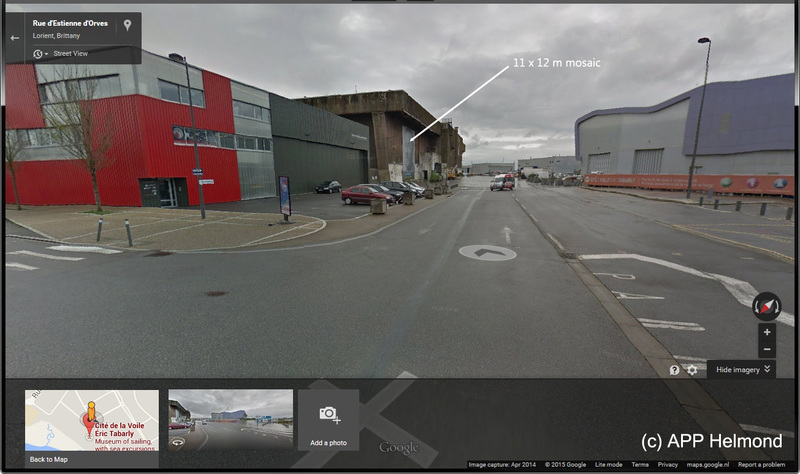 The result is now seen on the wall opposite the 'Cite de la Voile Eric Tabarly' in the Keroman area in Lorient. A truly great project. Picture 1: the mosaic needed to cater for 11x12 square meter prints, each 8 tiles of 12.5 cm in size, 96x88 tiles in total. Picture 2: even Google maps has now a glimpse of the giant mosaic on the wall. Combine thousands of portraits with an environmental theme, and then display this photo collection at the rear entrance of Langley Fine Arts School's (LFAS's) Chief Sepass Theatre, and this forest of faces has quite a tale to tell. Over a period of several months, roughly 30 senior photography students at LFAS worked on a large scale, 76-foot by 14-foot photo mosaic mural for the exterior of the school. This is a unique mural; it features 6,000 photographs of students and staff at LFAS arranged to form an image of the Blaauw Eco Forest. (source: Langley Times). The making of the mural required accurate grayscale teint matching, to both show the forest picture, while also keeping the quality and grayscale of the portrait lively. The resulting mosaic picture was 91700 x 16400 pixels in size, or 4.4 GB uncompressed bitmap, where each picture was used no more than 4 times. This way the quality was secured: what was finally printed was indeed very comparable with what we designed on screen. Finally, we also created a spreadsheet overview of each individual placed picture, so people can identify who is where... all 17,500 pictures. Picture 1: the mosaic consists of 350 x 50 pictures, each (portrait) picture was 2.62 x 3.28 inch in size. Picture 2: the sheer size of it becomes apparent when seen in perspective. Displayed on the wall along the staircase, the 46ft by 15ft mural showcases Surrey and its many faces. A true community collaboration, the mural features over 2,000 photos submitted by members of the public. Historic Surrey photos are also included. From afar, the mural looks like a river which leads to the new Indigenous Hall. The river theme reflects the 1400km of rivers and streams from Surrey's geography. It emphasizes that rivers have been a connection point for all people in Surrey for thousands of years. It also reminds us that rivers in Surrey are a source of transportation, food, sustainability and connection. The river theme was inspired by our renewed relationship with our three land-based first nations. (source: The City of Surrey). The challenge in this project was twofold: we hade to match a library of historic and community images with the serene image of a river, with trees, grass and air, while the mural had to follow the contours of the grand stairs in the museum lobby. It took several rounds of trial and error to come to a final mural design. Thanks to great enthusiasm and support from the museum folks, we finally got it printed on 12 panels, over the full height from ceiling to floor. Over 35,000 images of 6.5x8.2 cm (2.5 x3.2 inch) images were placed (approximate count), the total size was a 5.3 GB bitmap. With the mural also a 'roadmap' was provided of each individual image location, in case someone wishes to find a specific image. We are extremely proud of the result and to contribute to the community of Surrey. Picture 1: Left: the original colour image, right the grayscale source for the mural, center: the contour of the mural in the museum. Picture 2: Two beautiful images showing the mural in perspective of the lobby. On the right a (center part) of the full mural. The following example is a movie of swimming fish. Not really swimming, but moving as if they were swimming. The assignment was given by Rob Metsers (www.robmetsers.nl), a professional photographer, specialized in commercial movie creation with a passion for mosaic patterns. We teamed up to create this movie, where Rob's client wanted to draw attention to fresh fish in their supermarkets ('Verse vis' in Dutch). Sybren made the individual fish frames, one animation for each character, while Rob created the full movie. Each character consists of 200 individual frames (1920 x 1080), each frame was saved as a transparent PNG file. This way Rob could create seamless combinations of the characters of each word. This is only a teaser. The full movie can be shown here. In April 2017 we were asked to develop a stand-alone application for an in-store touchscreen laptop. The application was used to transfer an image into a brick mosaic, of certain size, and with a defined amount of bricks and limited palette of colours. The biggest challenge was to make it intuitive in use (used by in-store sales people), fun to look at, and secure (customer data had to be secured to meet the privacy demands). The customer image was send via a #tag, and was immediately available by the application when uploaded. The resulting application was developed on a touchscreen laptop, tested on different systems, and in portrait and landscape modes, because... well it's basically a tablet interface. The images below show the interface (we still need to ask permission to show the images taken from the grand opening in the Singapore store (picxelit.com)). The fun part was that each brick colour was represented by a symbol, for children to piece it together. A pdf output was created, with a complete symbol-location overview, so the right amount of each brick was purchased, and fun to play at home and to piece the brick mosaic together. The project had a lot of innovation under the hood: simple interface, interactive interface, quick response when different size and amount of colours were selected. The customer image needed to be cropped to select the area of interest, colour correction filters were required, and the size (amount of base-plates) had to be set. Basically it was the Legoaizer engine tweaked to speed, and in a design interface. Picture 1: left: interface with a mosaic image; right: the cut-out (enlarged) part. On its left you see the used colours and their fun symbols. Picture 2: left: admin interface, protected by an encrypted password; middle: customer data; right: dithered result. Just recently we were asked by a French entertainment agency, Sharingbox, to help to create a new application. 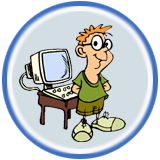 This application should be a mix between Wordaizer and Textaizer, must be managed via the command line, and fully integrated in their hardware. Their hardware would then be used to create a picture, which could be tweaked by the customer self into a black and white picture. Then the application whould create a text face, based on the black areas, together creating a stunning effect, ready for print-out. Which we did. This application creates exactly as was requested for. The examples below show the phases that the web-cam snapshot went through before finally being printed. And all of this within 10 seconds from snapshot to print-out. Picture 1: three steps from snapshot to print-out picture. The coloured bar in between is the automatically determined colour distribution template for the text colours. Picture 2: details of the print-out. It's a high resolution picture of 1800 pixels wide, good enough for 13x18 cm printing. An American based entertainment company, PopNoggins LLC, has asked us to develop a series of applications for their business. These applications were meant to be bundled in a suite called 'Visions'. This suite is still one of the pillars of sales for that company. Basically we had to develop 7 different applications, all interacting with their clients (= people like you and me on a fair, event or party) and deliver a fun trinket to keep. To mention a few: a 3D lenticular plastic picture, where two greenscreen snapshots put the person in any two environment; a free format drag and drop cube with 4 to 6 snapshots, and a greenscreen snapshot to put you in your favourite spot on earth on or the moon if neccessary. Picture 1: two pictures into one, from two greenscreen snapshots to one 3D lenticular print, left and right are printed on one 5x7 inch paper, and then placed at the back of the lenticular lens. Picture 2: only 4 snapshots are required to create and print this fun cube. The greenscreen background is filtered out automatically.